Now doesn’t that sound a lot fancier than plain old beef stew or beef in red wine sauce? Those French sure know how to make a culinary mountain out of a mole hill, don’t they? However you say it, hunks of beef braised in red wine is one of winter’s most comforting meals. I have a special method of making my version that helps give it a French-style, deep-dark rich sauce. 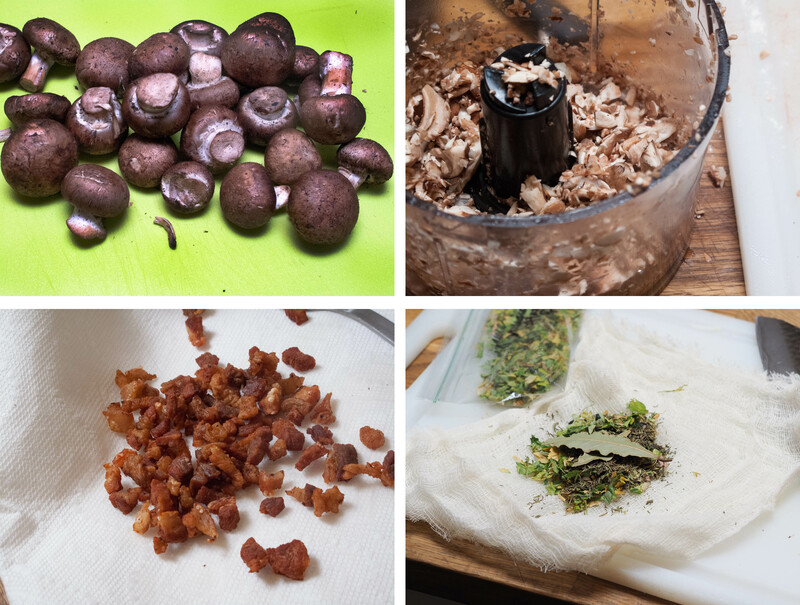 I chop a few handfuls of portobello or cremini mushrooms and add them to the braising liquid. This adds an intense depth of flavor, but it also makes for a sauce with lots of little bits in it so before I add the whole or halved or quartered mushrooms and pearl onions, I strain the sauce so it is perfectly smooth. We don’t have a photo for the finished dish ‘cause it is just too hard to make it look pretty – a photo of dark sauce and meat just doesn’t look very tasty to me. But, since I love my mushrooms they get a photo all their own. If you have any interest in the “real” boeuf bourguignon, Julia Child and Simone Beck gave us the real deal in 1961 when it appeared in Mastering the Art of French Cooking. If you don’t own the book, buy it – no cook should be without it. The following recipe should feed 6 hungry people. 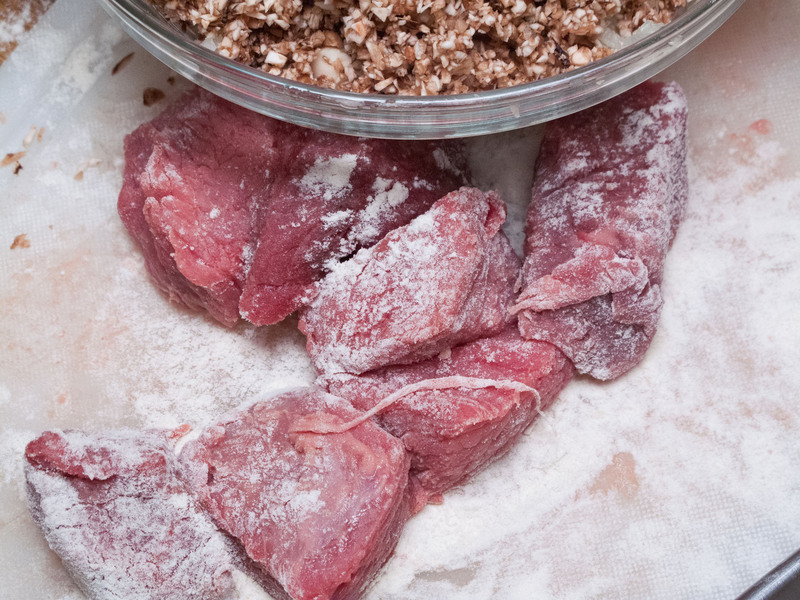 Place the meat in a large bowl and sprinkle with flour and salt and pepper. Toss to coat well. Set aside. If necessary, trim and discard the rind from the bacon and cut into cubes. Place the cubes in a Dutch oven over medium heat and cook, stirring occasionally, for about 10 minutes or until most of the fat has been rendered out and the cubes are just beginning to be crunchy. Using a slotted spoon, transfer the cooked bacon to a double layer of paper towel to drain. Shake the excess flour off of the meat and then place the meat into the hot bacon fat. Sear, turning frequently, until all sides are nicely browned. You will have to do this in batches. As browned, transfer to a plate. Add the chopped onion and mushrooms along with the garlic to the hot pan and cook, stirring frequently, until the mushrooms exude their liquid and the onions begin to color. Drain off excess fat. Add the wine, raise the heat, and bring to a boil. Lower the heat and simmer for about 5 minutes or just until the alcohol begins to burn off. Add the stock and tomato paste along with the sachet, stirring to blend. Season with salt and pepper. Return the meat to the pan, cover, and bring to a simmer. Lower the heat and cook at a bare simmer for 1 hour or until the meat is just tender. Remove the pan from the heat and, using tongs, transfer the meat to a plate. Strain the braising liquid through a fine mesh sieve into a clean bowl. Wipe out the Dutch oven and return the strained liquid to it, along with the meat. Add the whole or halved mushrooms and return to medium heat. Bring to a simmer and cook for another 30 minutes or until the mushrooms are cooked and the meat is very tender. During this last 30 minutes of braising, place the butter and oil in a large frying pan over medium heat. When very hot, add the onions, season with salt and pepper, and cook, stirring frequently, for about 5 minutes or until the onions are golden. Using a slotted spoon, transfer the onions to a double layer of paper towel to drain off excess fat. Spoon the pearl onions into the braising liquid. Taste and, if necessary, season with salt and pepper. Spoon the stew into a large serving bowl and sprinkle with the reserved bacon bits and parsley. Serve alone with lots of crusty bread to sop up the gravy or with noodles, rice, or mashed potatoes.